In recent years, the average tax refund has been in the neighborhood of $2,600. If you’re anticipating money back or already have your refund in hand, one way to put it to good use is on home repairs or improvements. Whether you want to stay within the amount of your refund or use it to cover a portion of a project’s cost, here are a few ideas to consider. Walk across the street and take a good look at your house and yard, trying to see your property as a passerby would. Is the landscaping starting to look a bit straggly? Has your last coat of paint started to fade? If so, make this the year that you spruce up your home’s exterior. 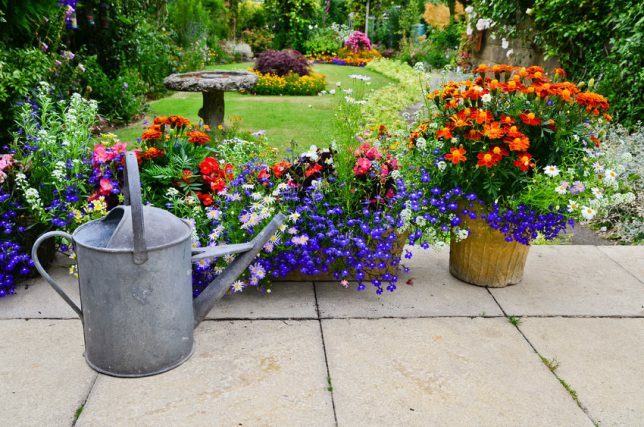 It’s relatively inexpensive to hire a lawn service for a one-time spring clean-up or purchase some new flowering landscape plants, and a fresh coat of paint always delivers a lot of bang for the buck, even if you hire a professional painting contractor. A new front door goes a very long way toward changing the look of your home. A new steel entry door can be had for less than $1,500, including installation, in most areas. If you have a garage and its door is showing its age, that’s another improvement that can be made for less than the average tax refund. Spring is a good time to make some upgrades in your home’s energy efficiency before summer’s heat arrives. You could have an HVAC professional contractor inspect your AC system to ensure there are no leaks in your duct system and that your unit is performing at peak efficiency. This is also a great time to add extra insulation in your attic (a place you probably don’t want to work in on a hot summer day). It’s easy to save more water by installing low-flow showerheads and toilets. The Environmental Protection Agency estimates that the average U.S. home can save nearly $100 every year just with a low-flow toilet, which uses about 1.5 gallons per flush as opposed to older models that can use three, five or even seven gallons of water per flush. If you’d like expert guidance on your home’s energy efficiency, your local utility company may offer services that help you assess your energy usage. There are even professional home energy audits available, which can cost about $400 but may be subsidized by your local utility provider. If you’re about to sell your home, staging can help make it much more attractive to potential buyers touring your home. With the vast majority of home buyers starting their searches online, staging will help the photos of your home attract more interest. You can have your home professionally staged for around $1,800, or do it yourself for much less. You can also pay to have a consultant put together a staging plan, then carry out the plan yourself. Even if your tax refund won’t cover large purchases, such as new roof or plumbing system, you can still put it to work on a long list of smaller items that may be in need of repair. You can fix leaky faucets, replace torn window screens, redo caulking around tubs and sinks, patch holes in drywall or cracks in plaster, replace broken pavers or deck boards, and much more. Leave your home improvements to the professionals. Make the most of your investment in your home by working with a professional contractor. At Contractor Connection, we’ve made it easy to find a local contractor who’s already been verified to have proper licensing, insurance and experience. Using our no-obligation matching service is free — just enter your ZIP code above to get started today.